Ideally located in the heart of the Riviera Maya along the white sand beaches and calm, clear waters of Akumal, this stunning resort offers adults a charming, picturesque escape complete with an exceptional luxury experience. Secrets Akumal Riviera Maya offers 434 luxurious guest suites, each featuring a king-size bed (or two double beds), private terrace or balcony, in-suite Jacuzzi for two, complimentary mini-bar and much more. 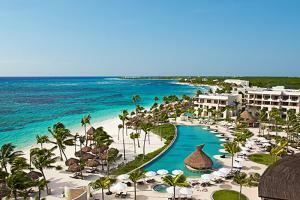 Located about an hour away from Cancun International Airport. Market Cafe - International Buffet; El Patio - Mexican Cuisine; Himitsu - Pan-Asian Cuisine; Portofino - Italian Cuisine; Bordeaux - French Cuisine; Seaside Grill - Grilled Specialties; Oceana - Fresh Seafood; Coco Cafe - Coffee & Snack Bar; Barefoot Grill - Light Lunch Specialties. Golf, Snorkeling, Sport Fishing, Scuba Diving, Deep Sea Fishing.